At a European school for diplomats daughters, Candice Hull (Kathy Dunn) is the American among a wide assortment of nationalities (more than thirteen, none of whom are frightened, despite the title). To help her friend keep his job as a spy, she secretly begins feeding him intelligence. I have this film as part of thew William Castle Collection, a series of his 1960s horror films. 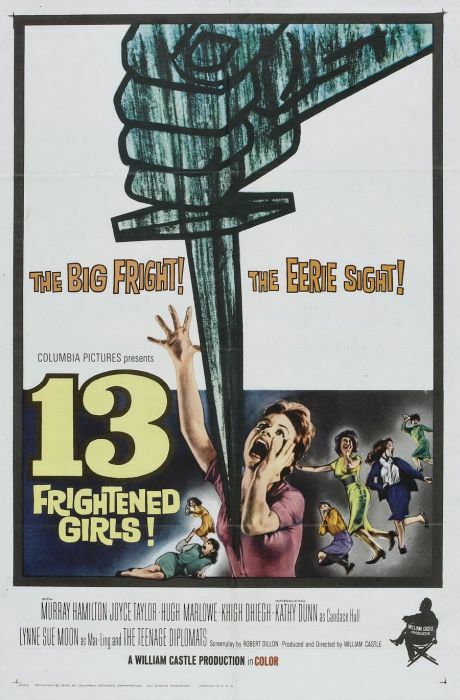 “13 Frightened Girls” is not horror, has no real stars to speak of, and as already mentioned does not have thirteen frightened girls. What it does have is a very juvenile approach to Cold War espionage. From the beginning, there’s commie humor – with the Russia and China girls calling each other “comrades”. And we find out that Red China apparently kills people and hides bodies in the embassy’s kitchen, with no consequences. In fact, despite all the threats, death and illegal action, no one ever seems to hold anyone at fault. In a sense, it turns espionage into a kind of joke — the threat of death is played down, even after a foreign spy is murdered. Candy never fully realizes what danger she is in, even when it’s really obvious. There’s other oddities. There’s an old man seduced by 16-year old Candy, though she ultimately fails. And the film has colors “like a Fauvist threw up all over the place”, in the words of another reviewer. I wouldn’t have made that connection, but sure enough… Henri Matisse could very well have painted the film cels. The rumor is that Castle launched a worldwide hunt for the prettiest girls from 13 different countries to cast in the film. Oddly, none of them, even star Kathy Dunn, went on to do anything in the movie business. I’m not sure what this says about the film… how does everyone get overlooked? Anyway, the film is interesting. Not Castle’s best work, probably not his worst. But if you want to see something outside the realm of PG-rated horror from Castle, this is the one you want. Geared more towards young adults, but enjoyable for anyone who wants to see a very unique perspective on Cold War spying.